Today I rode my bike to Home Depot to pick up a small item. I often ride to the store and can carry most things on my bike or with the help of a trailer. The Home Depot in Reston does not have a bike rack. About a year ago I asked the customer service person if they could install a rack. Nothing came of the request. I asked again today. I talked to the store manager. He said that he would ask corporate headquarters if they would pay for the installation but he wasn't hopeful. 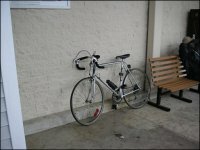 I told him that it's likely that his own employees bike to work and could use the rack. He assured me that his employees didn't ride bikes to work. I asked for his card so that I could follow-up later. He must not be very familiar with his employees modes of transportation. His employees, like many others in this area, use bikes for transportation. Many have not other means to get to work. You'll see their bikes parked outside restaurants and retail stores, locked to road signs, trees or fences. I walked outside the store and took photos of the three bikes parked in various places (see above). Later I emailed the photos to the manager along with specs for the inverted U bike rack used by DC, along with a quote for the Cycle Safe inverted U rack of about $170 for each rack plus installation, which I assume Home Depot can handle without too much trouble. I'll try to post any progress that is made. It is a shame that businesses do not provide this kind of low-cost amenity to their employees and customers. Less traffic, less pollution, great exercise. Bikes as transportation.